The Orion i series welders are the most advanced micro pulse arc welding systems available and feature newly developed Intelligent Welding™ technology. This new technology simplifies the welding process by automatically adjusting weld settings for any metal or application. 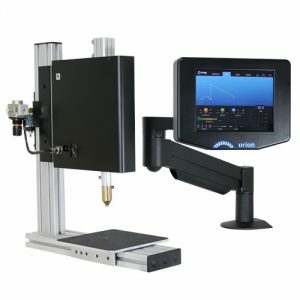 In addition, users can experience interactive touch screen navigation, high-frequency agitation for difficult metals like palladium, adaptive weld ignition for longer electrode life, a new multi-pulse setting for laser like welding, and more. The i series welders continue the Orion legacy by providing the most high-tech, versatile, and affordable welding solution on the market today. As with other Orion welders, the Orion i series welders utilises two different welding technologies – Pulse Arc and Tack. The Tack Mode uses resistance welding technology with up to 250 watt-seconds of energy. The Tack Mode is perfect for temporary placement or permanent fusion welding. The Pulse Arc Mode uses pulse–arc welding technology and consists of four distinct energy ranges – Ultra, Micro, Nano, and pico. The Ultra energy range uses up to 250 joules of energy (depending on model) for projects that require deeper penetration or a larger spot size. The Micro energy range uses up to 30 joules of energy and is perfect for moderate penetration and more delicate pieces. The Nano energy range offers precise weld energy control from 1.5 – 5 joules of energy. The Pico energy range offers extremely precise weld energy control from 0.01 – 1.5 joules of energy, perfect for very fine applications. By using the Orion’s weld modes and energy ranges together, users can experience the most versatile and complete welding system available. With a 30ws power potential, this thermocouple welder can be used by almost anyone and has the power to tackle all sorts of jobs. It’s perfect for those needing a welder for making quick, small welds on a light duty cycle. The mPulse power settings range from 5.0ws to 30ws, in 2.5ws increments—that’s 11 different power settings to choose from. The weld spot size on the smallest setting is nearly 1mm, depending upon your material. The largest setting of 30ws will yield a weld spot approximately 1.5mm in diameter, again, depending upon the material you’re welding. The mPulse works amazingly well with gold, silver and many other metals used in jewellery creation and repair. 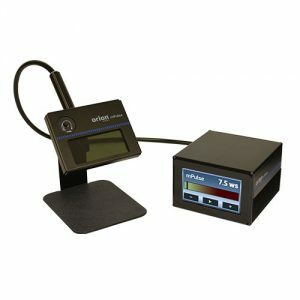 It’s a superior alternative to any solder application; and, measuring in at 5.5” x 5.25” x 3.625”, the mPulse takes up almost no space on your bench. Our customers use the mPulse 30 thermocouple welder for a variety of applications in addition to jewellery. Many glass frame repair shops can now fix broken titanium frames. Small scratches on molds are easily smoothed over with wire and a round of welds from the mPulse. 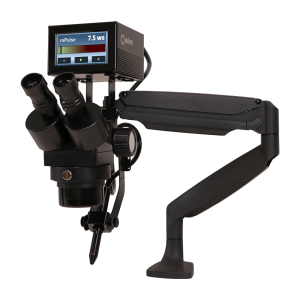 The Orion “mPulse Plus Mounted” is the smallest pulse arc welder mounted to a microscope arm. With a 30ws power potential, it can be used by anyone and has the power to tackle all sorts of jobs. It’s perfect for those needing a space saving pulse arc welder for making quick welds on a light duty cycle. The “mPulse Plus Mounted” power settings range from 3·0ws to 30ws, in 1ws increments—that’s 27 different power settings to choose from. The weld spot size on the smallest setting is nearly 1mm, depending upon your material. The largest setting of 30ws will yield a weld spot approximately 1·5mm in diameter, again, depending upon the material you’re welding. The “mPulse Plus Mounted” pulse arc welder works amazingly well with Gold, Silver, and many other metals used in jewellery creation and repair. 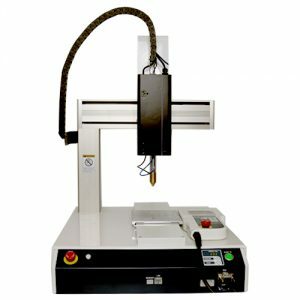 A pulse arc welder becomes an indispensable tool for dental labs or eyeglass repair shops as it gives them the ability to fix broken pieces or frames in seconds. Pulse arc welds are a superior alternative to any solder application and, measuring in at only 75mm x 75mm x 500mm, the mPulse Plus Mounted takes up almost no space on a work bench. 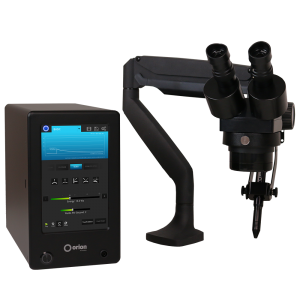 The Orion 100c2 is the compact, entry-level Orion welder, and was designed and developed to meet the needs of the market – smaller footprint to save space, easy-to-use touch screen interface for quick access and adjustments of welding parameters, high-frequency agitation options for difficult to weld metals, and all this at a low initial cost. The Orion 100c continues the Orion legacy by providing the most high-tech, versatile, and affordable welding solution on the market today. The Orion 100c offers two different weld modes: Pulse Arc Mode and Micro Mode. Whether an application requires high power welding needs or intricate, precise welds around precious components, the Orion 100c has the flexibility to weld with power and precision. The Orion Welders product line has the potential to help users increase profits, save time, and unlock potential. By using innovative pulse arc technology, the Orion welders perform laser-like welds without the expensive price tag. Utilizing new technology, users can become proficient at welding within minutes, and can customize every aspect of the machine to fit their preferences. Accessories available. Please contact PW for further information. The Orion 150s2 micro welder, our mid-range model, is the ideal solution for any small application welding need. The sSeries welders can be seen in laboratories, universities and research & development institutions around the globe. Priced below the competition with features created by our team of welding engineers, the 150s2 micro welder boasts a power potential of up to 150 joules of pulse-arc weld energy. While powerful, the 150s2 is perfect for low power needs as well—working at as little as 2 joules of energy. Even with such a large range in power, full control is maintained as the 150s is adjustable in 0.2 joule increments. The 150s2 micro welder has two weld modes: Pulse Arc Mode and Tack Mode. In Tack Mode, it’s easy to temporarily join two separate pieces together. Pulse Arc Mode allows for full micro tig welding on nearly any conductive metal. Simply adjust power to accommodate for metal type and thickness of your piece and application. Whether an application requires high power welding needs or intricate, precise welds around precious components, the Orion 150s2 offers a versatile, compact, and affordable micro welder system in an easy-to-use package. The Orion 250s2, our mid-range model with some extra power, boasting a power potential of up to 250 joules of pulse-arc weld energy. While powerful, the 250s2 is perfect for low power needs as well—yielding as little as 1 joules of energy. Even with such a large range in power, full control is maintained as the 250s2 is adjustable in o.2 joule increments. The 250s has two weld modes: Pulse Arc Mode and Tack Mode. 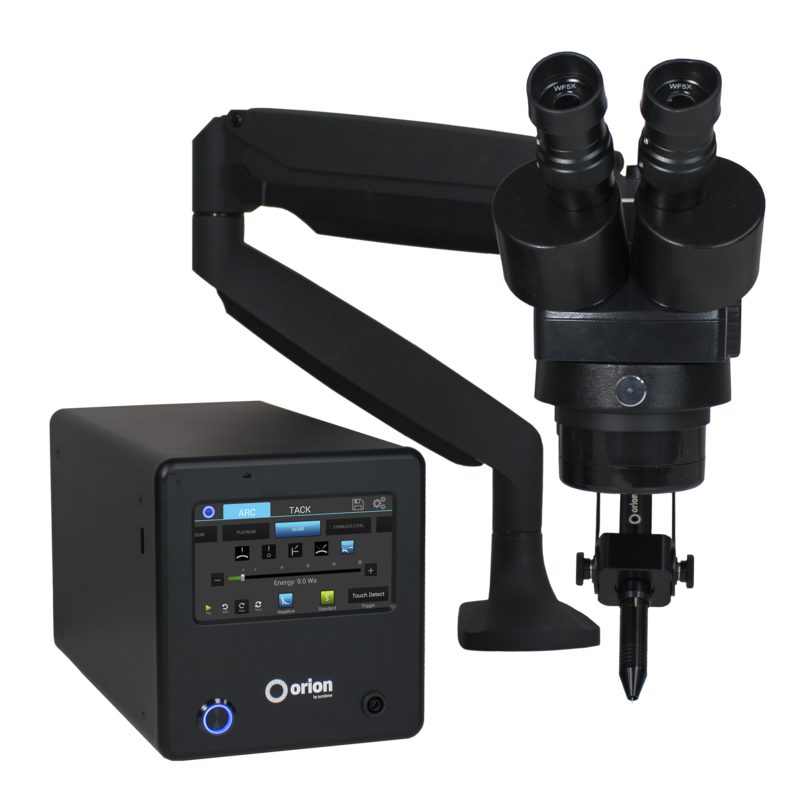 Whether an application requires high power welding needs or intricate, precise welds around precious components, the Orion 250s2 offers a versatile, compact, and affordable welding system in an easy-to-use package. The Orion 200i2 (Patent D740,338) is the most advanced pulse arc welding product in the world. It is packed with features that will simplify the welding needs of any jeweller, goldsmith, or silversmith. 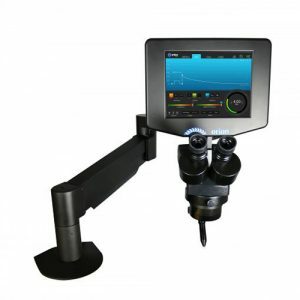 Innovative features include: Pico weld mode for intricate welds as small as 0.01 Joules of energy, to achieve truly microscopic weld joints; user settings up to 200 joules of energy for large silver or platinum pieces; a large 10” touch screen interface with one-touch access to all pulse arc welding parameters; the ultimate space saving design; and 3 unique pulse shape wave form options to choose from: Classic Orion (for Orion users that have come to love welds produced by the Orion 150i), Triangle (for weld smoothing), and Square (laser like welding at a fraction of the cost). The Orion 200i2 also introduces a patented feature—Seam mode—a revolutionary breakthrough in pulse arc welding. Seam mode allows users to mimic laser welding with weld speeds up to 30 welds per sec. The patented Orion 200i2 is a full-featured, precision welder with the speed of a laser, paired with the versatility, power, and ease of pulse arc welding. Similar to the 200i2, the new Orion 250i2 (Patent D740,338) is packed with features that will simplify the welding needs of any user. Innovative features include: Pico weld mode for intricate welds as small as 0.01 Joules of energy, to achieve truly microscopic weld joints; user selectable up to 250 joules of energy for large pieces; a large 10” touch screen interface with one-touch access to all welding parameters; the ultimate space saving design; and 3 unique pulse shape wave form options to choose from: Classic Orion (for Orion users that have come to love welds produced by the Orion 150i), Triangle (for weld smoothing), and Square (laser like welding). And introducing the new Seam mode—a revolutionary breakthrough in micro pulse arc welding. Seam mode on the 250i2 allows users to mimic laser welding with weld speeds up to 30 welds/sec in 5 second durations: That’s 150 welds in 5 seconds! The patent pending Orion 250i2 gives you the precision and speed of a laser with the versatility, power, and ease of a pulse arc welder. An all new design and performance. This latest update takes all of the great features from our previous model and adds to it with a new motorised weld head adding greater control, precision, and uniformity to every weld. Manufacturers can produce lighter, more compact battery packs without compromising power or capacity. One of the biggest challenges when welding EV Batteries is finding a welder capable of welding highly conductive metals such as copper and aluminium. Inside a lithium-ion battery are various copper and/or aluminium components that carry the electrical current (such as buss bars). These components are commonly joined to either similar or dissimilar materials to facilitate the electric current. If the joint is not made properly, there is a potential for voltage drops due to the resistance between the two pieces. Visit the our YouTube channel to see 64 videos of Pulse Arc Micro Tig welding.